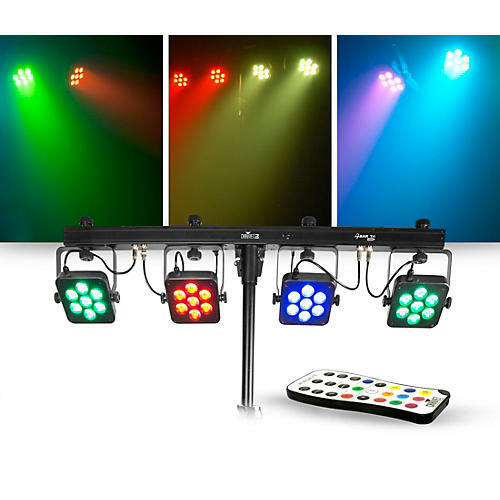 Whether you’re a mobile DJ or live performer, this dynamic lighting package offers convenience and ease-of-use, delivering bright, exciting effects, with no-frills simplicity—all at a price you can afford. We've made it easy for you to get all the basics with one simple purchase. You’ll get set up in just minutes, so you’ll spend less time worrying about lights and more time focusing on your performance. IRC-6 is an easy-to-use infrared remote control that provides instant access to pre-programmed scenes, color mixing options and on-the-fly speed adjustments. This compact and lightweight remote has an approximate range of 30 feet.